Sunday is the sixth annual Saltburn Food Festival a celebration of the very best things to eat and drink from both here on our own doorstep and around the world. This year’s event – on Sunday July 29 from 10am to 6pm – sees an increase from 125 to a record-breaking 150 stalls and is once again expected to attract around 20,000 hungry food-lovers as the popular seaside town is transformed into a bustling festival village for a day. Organiser Lorna Jackson, who co-owns Saltburn’s Real Meals Deli and Bistro and also runs the monthly Saltburn Farmers’ Market, had the brainwave of holding a festival during a holiday in France. And she says the event’s stunning success proves you no longer have to travel abroad to experience the good life. “We were visiting one of the many festivals held throughout the summer over there when I realised there was nothing they were doing that we couldn’t do just as well here,” she says. “People had often come into Real Meals after their own holidays and talked about their wonderful experiences of being outdoors, with all the villagers coming out and the local vineyard bringing their wine. The festival began in Milton Street but now sees much of the town centre filled with stalls offering an ever-growing range of tempting delights, as well as exhibitors, entertainment and world-class demonstrations from award-winning chefs in the live cookery theatre. “We worked closely with the council last year and they encouraged us to double the festival footprint, so the crowds could spread out and make the day even more enjoyable, with an arts area, live music, exhibition corner and chill-out areas,” says Lorna. “We were a little bit worried we’d have empty streets but that didn’t happen, the response was amazing and the buzz just got bigger! We’ve got some excellent exhibitors and traders and more and more establishments in Saltburn want to join in, so we've developed a 'fringe' and it’s getting better every year. “Last year we brought in more street food in the world cafe areas but people told us they also wanted to take food and drink home to enjoy, so we’ve increased the shopping area too. Although the emphasis is firmly on local produce and ingredients, the cuisine on offer has a distinctly international flavour, with sizzling street food from all corners of the globe, including Armenian, Chinese and Russian cooking. Hand-pulled cider and craft ales are on offer to help wash it all down, as well as chilled prosecco and a wide range of gins. Independent traders come from all over the North East, including the Redcar and Cleveland area, Durham, Tynemouth, Hambleton, Stockton and as far as York. “This is how most of them make their living, which is why it’s really important to support them,” says Lorna. 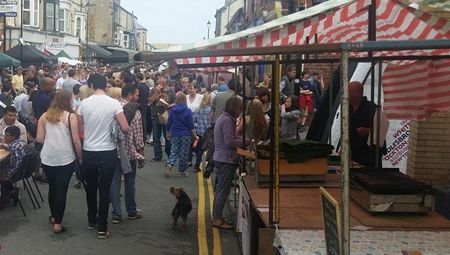 “We have some really special traders that only come to Saltburn Food Festival and don’t sell their wares elsewhere, and others who are just starting out and hoping to make food their future. The festival attracts people of all ages and provides a safe space for families, with no cars around and a lost children point and first aid facilities on hand. “The earlier you give children a variety of different foods, the better,” says Lorna. “The festival provides a 360-degree sensation with the things you see, smell and taste. A traffic management plan will swing into operation to try to ensure the roads flow even better than on an average weekend in Saltburn, despite the far greater numbers of visitors. Milton Street, Dundas Street East and Station Street will all be closed to vehicles. For many foodies throughout Teesside and further afield the festival is a firm date in the annual calendar, but if you’re planning to come for the first time, Lorna says don't be bewildered by the dazzling range of fayre on offer. To rate this article select the number of stars you think perfectly rates this article.